You can find Emily here and here on Ravelry. The initial spark of an idea often comes to me in unexpected times and places - the shape of a leaf on the windshield, or the pattern on a chain link fence. At that point I start experimenting with stitch patterns, and by the time I go through swatching, charting, frogging, re-swatching, re-charting, and re-frogging, the finished design often bears little or no resemblance to my initial inspiration. For me the process is far more important and enjoyable than the original inspiration. How did you develop your design focus on lace shawls? 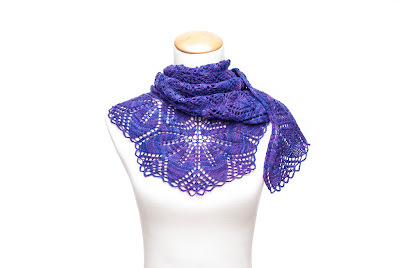 I’ve always been drawn to intricate techniques in knitting, and have gone through various obsessive stages, but when I first discovered lace knitting everything just clicked. I love the endless variety of ways in which basic stitches can be combined, I love working with fine gauge yarn, and the absolute magic of watching your shawl come to life during the blocking process never gets old. I love looking at the amazing designs others create. I browse Ravelry like a magpie, picking up shiny bits and pieces that catch my eye. It might be a striking color combination, an unusual cast on, or some other small detail that I file away for possible consideration. For me this is an important part of defining my “voice” as a designer. While there are certainly some completely innovative designs out there, most are a combination of stitches, shaping, and sizing that have all been done before. The challenge of designing is all about selecting which elements to use, and composing them into a harmonious new creation. How do you feel about the so called controversy of “dumbing down” patterns for knitters/crocheters? I feel strongly that a well written pattern is by nature accessible to all but the most novice knitter. I learned this lesson the hard way, as I’m the type of knitter who prefers “pithy” style directions, as the great Elizabeth Zimmerman calls them. 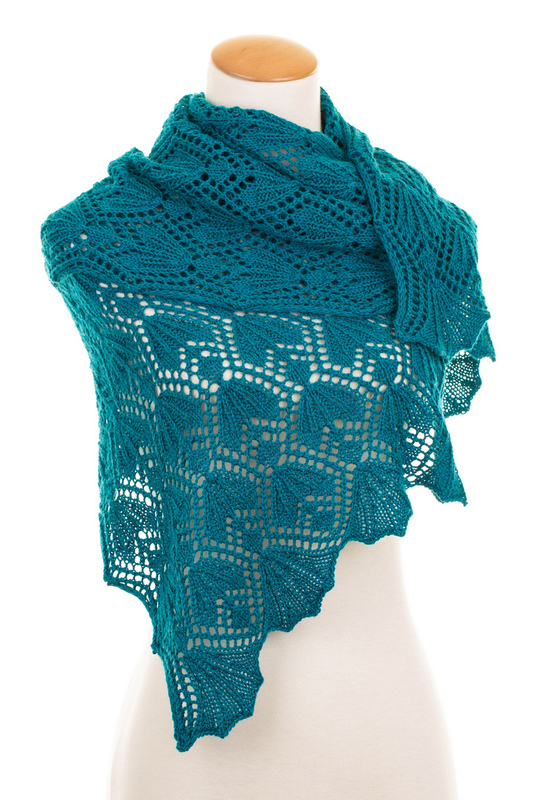 When I initially published Haruni it was a very bare bones pattern - there were no line by line directions, or explanation of how top down shawls are shaped. It even included the dreaded phrase “continue in lace pattern as established”. 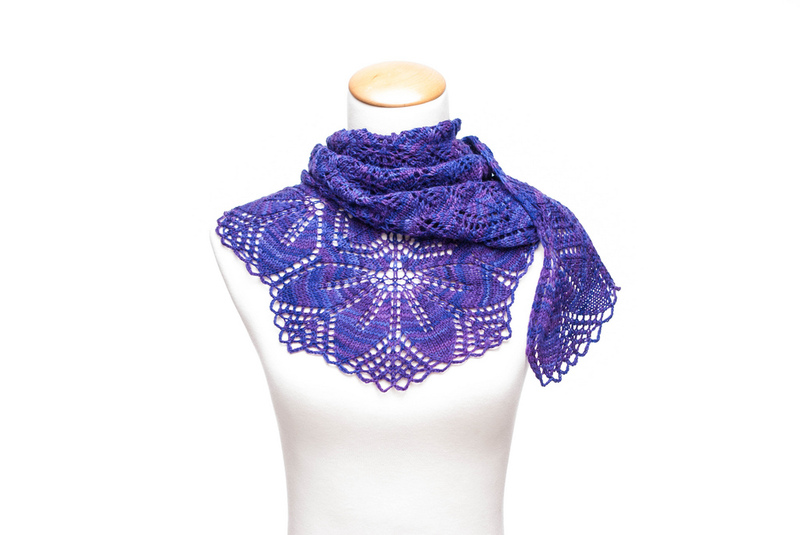 I was soon overwhelmed with questions from knitters, many of whom were far from beginners, but hadn’t worked lace before, or couldn’t visualize how a top down triangular shawl worked. I incorporated all of these explanations into the pattern, and after several revisions I finally have a pattern that with enough patience (and lifelines! 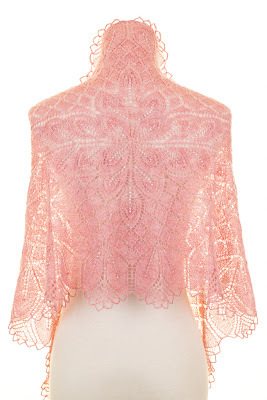 ), can be made by nearly any knitter. 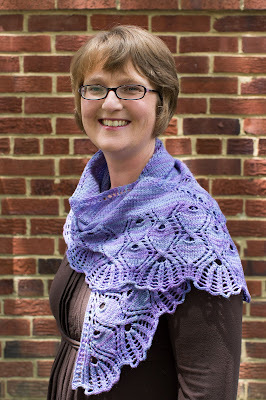 I absolutely love hearing from knitters who used this pattern as an introduction to lace knitting. I have at times used sample knitters, but in general I prefer to knit my samples myself, as I often tweak elements of the design as I knit. And of course I design primarily because I enjoy knitting. No. I didn’t start out thinking this was going to be a business. We (my husband is a full business partner) have kind of figured things out as we go. We’re currently in the process of expanding to the next level. While I’ve met lots of wonderful and encouraging designers online, I don’t really have a specific role model. I can safely say that our business would not exist without the Internet. I’m a third generation knitter, and I don’t think I’ve ever knit a pattern without some modification, but it never occurred to me to write down what I was doing. I first started creating charts for my own use when I was working on lace shawls for our wedding. 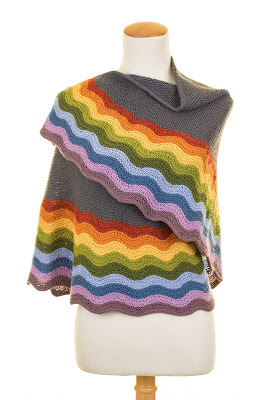 I was blissfully unaware that the idea I had in my head for a rectangular shawl knit in the round was difficult; I just dove in without figuring out any of the math. I innocently posted some photos of the finished shawl on Ravelry, and was blown away when people started asking me for the pattern. It was only as I tried to explain this pattern to others that I realized how complex it really was. Interestingly enough, I am just now preparing to publish this design - called Amillë. Without the interest, persistence, and encouragement of the online community I never would have thought to publish patterns. I use an army of test knitters, and my husband Brian is my tech ninja. His skills in graphic design, layout, photography, web design, and general tech issues are an integral part of the business. He has an editor’s eye for errors and inconsistencies, and creates virtually every detail on the page. Together we deliberate over fonts, text flow, chart placement, etc., so that our PDFs work beautifully in print, or on screen. As we like to say, I do the knit things, and he does the tech things. This is a tricky one. As I mentioned before, my husband is a full partner in the business. We are both active duty military, and have a 2 year old daughter. We fit things in as we are able, and make sure to always have fun with it. I try to learn and improve. In general I find the knitting community to be incredibly positive and supportive. When someone has a genuine critique I take it to heart, and think about how I can improve. This is an ongoing process. For right now this is supplemental income. We look forward to the day when we can retire and devote more time to our knitting and tech pursuits. What advice would you give someone who wants to pursue a career in knitting design? Don’t be intimidated, and don’t give up. It can be scary to release a new pattern, but remember that the worst possible outcome is just a pattern that doesn’t generate a lot of interest. I think every designer has a pattern (or 2 or 3) that just don’t do as well as others. As long as it is something you are proud to have your name on, it’s worth sharing. Enlist as much help as you can. To truly be a successful designer you have to wear so many different hats (hand-knit hats, of course), it is nearly impossible for one person to do it all. If you’re lucky you can marry someone whose skills compliment yours nicely, like I did! Emily's newest design to be published soon. What a fabulous interview! It's always interesting to read how designers go about things and Emily is so grounded. Her designs are simply wonderful, too. I've just finished my test knit of Amille and it was a joy to knit - the pattern is so well written and presented, and the design in gorgeous. I've had so many compliments and several people have offered to take it off my hands, too. NO WAY!! thank you for your service - both to our nation and to "craftmates"